Hudson Crossing Park’s Play Garden is a unique feature that invites children of all ages to play amongst a garden filled with opportunities to explore. The only of its kind in the area, the play garden serves as an example of environmental stewardship through innovative use of recycled materials. Imagination soars while wooden stepping “stones” and huge rocks promote exercise and help develop balance. Repurposed construction tubes offer curious visitors tunnels that lead to new discoveries. Flowers and shrubs attract butterflies and songbirds creating an atmosphere of wonder. 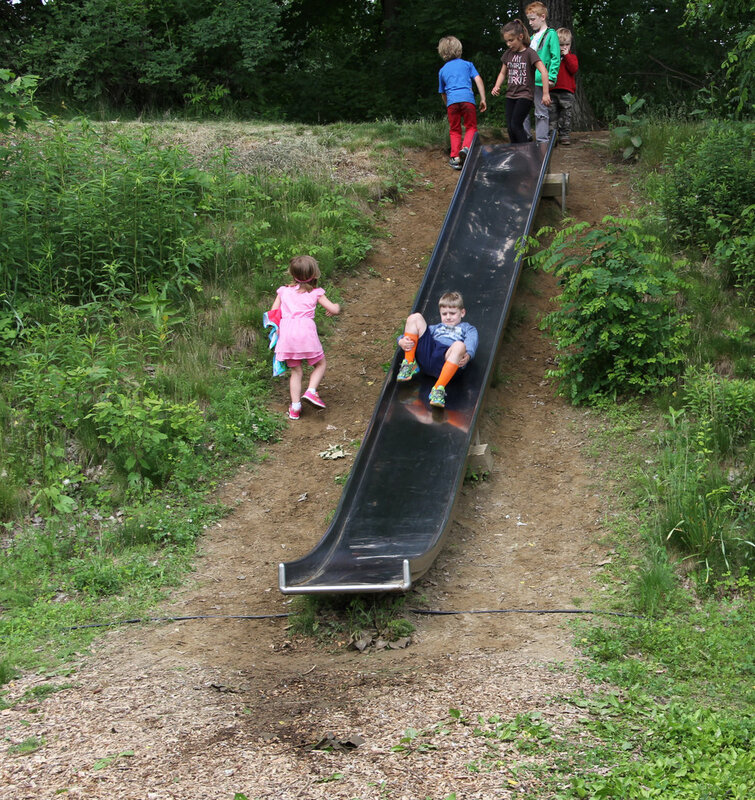 A slide built into the side of a hill is a favorite experience, offering the reward of a ride after climbing the hill to get to the top. A flower bed and a sandbox are created thanks to repurposed satellite dishes and cement culverts. Beautifully landscaped with native plants and plenty of opportunities for the young and young-at-heart to explore, plan on spending some time here during your visit! Willow tunnels, wetlands with resident turtles and frogs, bird and bat houses throughout the park, and so much more - Hudson Crossing Park's Play Garden offers lots of opportunities to explore the amazing natural offerings that we can find right in our backyard! In many ways the heart of Hudson Crossing Park, the labyrinth was created as a space for visitors of all ages to walk, reflect, and find a peaceful moment. Entered through a living willow tunnel, a recycled roofing slate path leads through a bed of thyme to the labyrinth’s center. While following the path you hardly notice that the labyrinth walls are a circular berm that converts this feature into an amphitheater when the park is a venue for various events. A truly unique feature, it is located just beyond the pavilion and park entrance. Lots of Places to Play! There's always fun to be had at Hudson Crossing, with slides, swings, and even a pirate ship! (Legend has it the other half is somewhere deep in the canal.) The Play Garden offers a perfect spot for the young (or young-at-heart!) to let loose and have some fun.